Celebrate Christmas and New Year in a Luxurious Caribbean Villa! 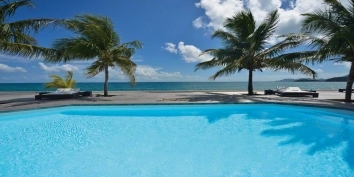 Celebrate Christmas and New Year with family and friends in a luxurious Caribbean villa! It is very difficult, if not almost impossible, to find luxury Caribbean villas that are still available for Christmas and/or New Year. However, due to a late cancellation, Villa Mystique on the beautiful island of Anguilla is now available between 20 December 2014 and 4 January 2015. Villa Mystique is reputed to be the largest villa on the exclusive island of Anguilla with a total of 21,000 square feet (almost 2,000 square meters). With 6 bedrooms, 8.5 bathrooms and no less than 3 (yes, three!) 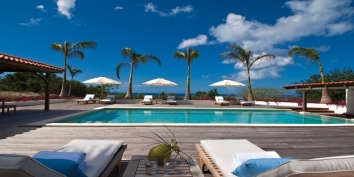 swimming pools, Villa Mystique provides luxury Caribbean living for up to 12 guests. In addition to daily staff, a private chef for breakfast and lunch is included in the price. Dinner chef can be arranged at additional cost. Minimum of 10 nights is required and no holds are accepted. Full payment will be required to secure your reservation. 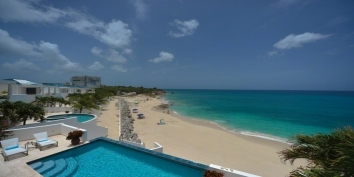 See the full villa listing for a full description and huge photo gallery of Villa Mystique, Villas at Sheriva, Cove Bay / Maundays Bay, Anguilla. NOTE: all rates correct at time of publishing, but subject to change at any time without notice.